The holiday season is upon us, and that of course means that the travel itch has kicked into full gear. This year, I wanted to do something extra special for Jessica and myself, so we’re headed to Bali, Thailand, and Vietnam over the holidays. My original plan for the "big trip" of 2017 (or should I say "bigger trip", since the around-the-world adventure I had back in May was already pretty big) was South Africa, but unforeseen circumstances forced me to shelve that trip until further notice. Once everything had been cancelled and refunded, I began looking for another way to end the year with a bang. As I mulled it over, I vaguely recalled that Jessica keeps a bookmark in her browser of this boutique eco-lodge in Bali, Indonesia, called Bambu Indah. In fact, she'd seen it a few years ago and had kept it on her bucket list ever since, prodding me every couple of months that she wanted to go experience the resort's distinctive hand-built villas that resembled traditional Balinese bridal homes. That put Bali on the map, and I began to build the trip around that. I'm kind of obsessive when it comes to tweaking my itineraries, so throughout the rest of the year, the trip kept changing forms as different flights became available. First it was a Tokyo stopover for New Year's Eve, then a Seoul side-trip, then we settled on welcoming 2018 in Thailand. Then I added a short layover – first in Guangzhou, then in Hanoi – and then my Thai friend moved the celebrations to Ko Samui rather than Bangkok, so I added flights to Thailand's party island. The main flights for this trip were booked earlier in the year, about 6-9 months prior to the date of travel. 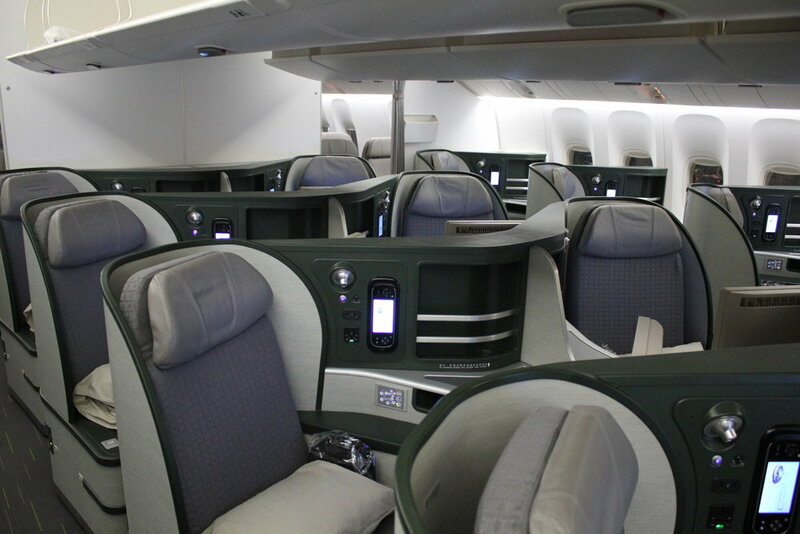 For the outbound, we’re flying on EVA Air business class once again, on the direct flight from Toronto to Taipei and then onwards to Denpasar–Bali (DPS). I found EVA Air’s business class product to be outstanding when I flew it back in June, and I’m hoping for a similar experience this time around. I had actually gotten quite lucky when I booked the flight – as you can imagine, most of the availability around Christmas Eve had already been snapped up, but all of a sudden, EVA changed the schedule to operate daily direct flights to Toronto, rather than 5x weekly. I was able to get in on the business class availability on one of the two extra services per week right as they were loaded into the system, grabbing the one-way award for 77,500 Aeroplan miles per person. For the return sector, I’m knocking a big one off the bucket list: Japan Airlines First Class! The partnership between JAL and Alaska Airlines makes it easy to redeem Alaska miles for travel on JAL, and at 75,000 miles for a First Class one-way award, the value is pretty incredible. The redemption takes us on business class from Hanoi, Vietnam, to Tokyo Narita, and then First Class onwards to Chicago. From Chicago, we’re catching an Aeroplan short-haul award flight back to Toronto. Hanoi was the only place near South East Asia that had business class availability on the new JAL Sky Suite (which I really wanted to try), so that’s why the award originates from there. In the interim, we’ll be spending five nights in Bali, three nights in Thailand, and one night in Vietnam. Finding a way to get between all these places was a challenge in itself, but it all worked out at the end of the day. From Denpasar–Bali to Bangkok, I booked an economy class flight on Thai Lion Mentari, a low-cost carrier, for $125 per person, and I intend to use my Scotia Rewards points and other fixed-value points to “wipe out” this out-of-pocket cost. The same can be said for a portion of our Bangkok Airways flights between Bangkok and Ko Samui. The last “gap” to be filled in was the short flight between Bangkok and Hanoi. Much to my surprise, it turns out that there’s a lie-flat business class product you can fly between these two cities: Qatar Airways! Qatar operates nifty little a fifth-freedom flight here, and you can use Avios to book business class for only 9,000 Avios per person, one-way. Incredible value! So to sum up, the overall routing of the trip looks as below. It’s one of the most convoluted trips I’ve booked to dates, and I'll shed more light on booking complex awards like this in the separate "behind-the-scenes" post. The Bambu Indah resort, which was the driving force behind booking this trip, is unfortunately not affiliated with any major hotel chain (I mean, it is an "eco-lifestyle boutique hotel" after all). Since it was a bucket list item for Jessica, I decided to take the US$275/night peak-season rate in stride, booking a stay for three nights. One of the things that sets Bambu Indah apart is its Balinese villas, which all feature unique designs and interiors. We picked the Udang House, which offers a glass floor over a natural pond, a private porch, and a part-indoor, part-outdoor shower that provides "an opportunity to commune with nature". I love it! The resort also offers free breakfast and afternoon tea to all its guests, as well as a variety of on-site and off-site activities, ranging from spa treatments to village hikes. It's located in Ubud, the artistic and cultural hub of the island of Bali. Of course, Bali is also well-regarded as one of the world's resort paradises, so I couldn't miss this opportunity to use my hotel points to check out some of the island's fancy properties. I decided on The Ritz-Carlton, Bali, which, at 40,000 Marriott Rewards points per night, struck me as surprisingly cheap for a Ritz-Carlton. I booked two nights here for a total of 80,000 points and, quite satisfyingly, $0 in resort fees. That brings us onto Bangkok, which is quite a reasonably priced hotel market, so it's often a toss-up between using cash or points. Since I'm travelling in peak season, though, points turned out to be a better bet across the board, so I redeemed 60,000 Marriott Rewards points for two nights at the JW Marriott Bangkok, a Category 6 property. For my one night in Hanoi, I decided to mix it up a bit, and booked a room at the InterContinental Hanoi Westlake for 25,000 IHG Rewards points that I had lying around from many years ago. This hotel looks stunning – it features pagoda-style houses that stand atop the water in Hanoi's central lake, almost reminiscent of the overwater villas of the Maldives. I'm beyond excited for my stay in Hanoi, even if it's only for a night (being an avid pho lover helps too, I suppose). I simply can't wait for this one. There's just so many things about this trip that I'm looking forward to – from rediscovering the comforts of EVA Air to getting a taste of Japan Airlines's coveted first-class product (with a sampler on Qatar Airways in the middle); from the tranquility of Bali to what I'm sure will be one hell of a New Year's Eve bash in Thailand; and from pad thai to pho, and everything in between, for putting on my winter weight. It promises to be a fantastic trip, and as always, you can look forward to the full reviews and highlights from my travels.